Fit4Ed Education Program Using Pedometers by HRM at Art Yoga Studio. MPN: Fit4Ed-Kit. Hurry! Limited time offer. Offer valid only while supplies last. Provides mathematical exercises for K-8 students. Motivates, increases physical activity, explores mathematical concepts and practice skills. Provides mathematical exercises for K-8 students. Motivates, increases physical activity, explores mathematical concepts and practice skills. 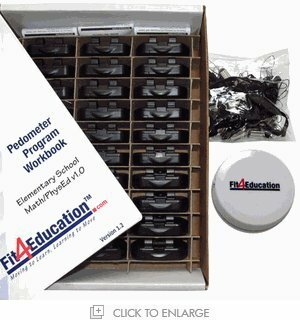 Contains: Teacher's booklet, 30 pedometers, 30 safety leashes, tape measure and pedometer instructions. If you have any questions about this product by HRM, contact us by completing and submitting the form below. If you are looking for a specif part number, please include it with your message.